They came from as far as Hawaii, and from as near as Hanover, Pennsylvania for a reunion at Gettysburg. The eldest in attendance was 88 years of age, and the youngest were babes in arms. They vary in the way they spell their surnames now: Sherfy, Sherfey, or Scherfee. Their common ancestor was Kaspar Scherfigg, who, as he boarded the ship bound for America in 1751, changed the spelling of his appellation to the more Anglo version, Casper. Casper was just 16 years old when he left Coburg - a village in the southwestern corner of Saxony - and traveled down the Rhine to Rotterdam. From there crossed the Atlantic to the United States. He eventually settled in Taneytown, Maryland, where he lived until 1784. He and his wife, Magdalena, had 15 children - 10 of whom lived to adulthood. The descendants who attended the national Sherfy/Sherfey reunion on July 1 and 2, 2006 were the descendants of three of Casper's sons and one of his daughters: Johannas, Abraham, Jacob, and Maria. The Sherfy reunion began on Saturday, July 1, in Westminster, Maryland, where the family members mingled, dined, and enjoyed presentations about their common ancestry. The original Scherffigg Bible, belonging to Caspar and Magdalena, was on display. Family photographs were taken of the descendants of Johannas, Jacob, Abraham, and Maria. The four family members present who were part of Maria's lineage were also descendants of Jacob - so they have a unique privilege of a double Sherfy lineage. Jacob, son of Caspar, built the first Sherfy farm in Gettysburg in 1818. A solid, rock-hewn home that is approaching two centuries in age, the home is now known as the Rose Farm, named after the man who owned it during the Battle of Gettysburg. Joseph Sherfy, Jacob's son, lived on the farm he had built just up the Emmitsburg Road, with a large peach orchard and a cannery on the premises. Johannas had moved west, to Tennessee, and Abraham remained near his parents in Maryland (he purportedly died in Virginia). Maria married Nicholas Onstott and moved to Illinois - where their son, Hugh, lived and cared for his widowed mother in her advanced age. Hugh purchased a boarding house in New Salem, and in doing so took on a perpetual boarder - a young lawyer named Abraham Lincoln. It was Hugh Onstott, a cooper, who helped Lincoln procure his first major speech in Illinois. The speech was a success, and Lincoln's career began to climb. It was one of Casper's descendants who helped Lincoln's star to rise. 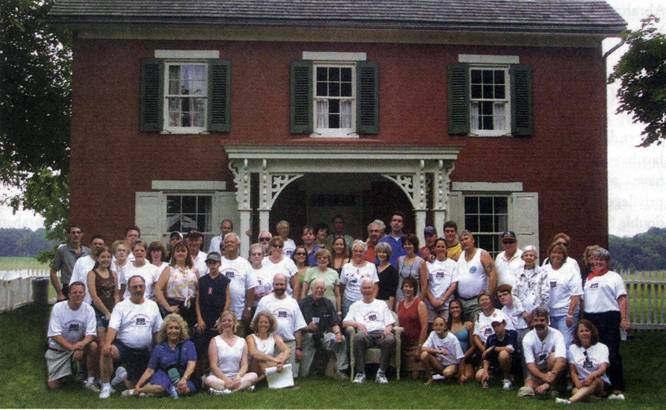 On Sunday, July 2, the Sherfy reunion continued with a visit to the historic Sherfy Farm in Gettysburg. There historian and licensed battlefield guide Tim Smith met the group and shared some anecdotes about the epic battle in the middle of which Joseph, Casper's grandson, and his family suddenly found themselves. On July 1, 1863, the day was oppressively hot. Joseph Sherfy and his family continually drew water from his two wells for the relief of hundreds of dust-covered, thirsty soldiers. Joseph's wife, Mary, kept busy in the kitchen baking bread, which she and her daughters gave to the grateful soldiers. One hundred forty-three years and one day later, while standing in the vestiges of the past at the Sherfy home, Casper's kin could imagine their discomfort, as the temperatures climbed into the nineties. A favorite story passed through the Sherfy family was the story of Joseph's mother-in-law, Grandma Haegen, who lived with the couple and their six children at their Gettysburg residence. As soldiers in blue and gray amassed in Gettysburg and prepared for battle, Joseph and Mary Sherfy considered leaving. Grandma Haegen did not want to depart, and insisted they stay put. On the morning of July 2, the worst day of the contest, the battle did not begin south of town until the afternoon, but in the morning skirmishers from both sides were testing for each other's presence, within shooting range of the Sherfy farm. As Grandma Haegen was in the yard that Thursday morning, a minie ball, shot from a Confederate musket, hit a nearby post and delved into the folds of her skirt where, spent, it finally lay upon the ground. She picked up the bullet and announced, "It's time to go to Taneytown." At 10:30 a.m., the Sherfy family headed south, and stayed for a few days in the village of Two Taverns 1. It had been a wise decision to leave. The Sherfy Peach Orchard was a central place for heavy fighting. Most of the thousand trees of the Peach Orchard were destroyed, the barn was burned to the ground, and in all, nearly $3000 worth of damage was done to the property. When the family returned home on July 7, they also found the house riddled with bullets and shell fragments, their mattresses and linens soaked with blood and human detritus, the home ransacked and clothing strewn all over their yard, from the house to the smoldering remains of the barn. In addition to the destruction of property, there were also human remains - fourteen burned bodies of unfortunate soldiers also lay among the wreckage. The Sherfys received little, if any, compensation for the damage. They immediately set to work to make their home livable again. They harvested what remained of their peaches, and enjoyed a tremendous business that year - which helped meet expenses to repair their home. Today, the Sherfy farm looks much the same, and probably just as inviting, as it did in the summer of 1863, before the terrible battle injured and destroyed it and the soldiers who participated there. Amazingly, the minie ball that hit Grandma Haegen's skirt was preserved and documented, and is currently housed at the Adams County Historical Society - a gift of Otelia Sherfy, Joseph's daughter. On July 2, 2006, the Sherfy descendants were able to see the minie ball that convinced their relatives to leave Gettysburg. They also viewed a 12-pound solid shot cannon ball that for many years was lodged in a large cherry tree beside the house. Inside the Sherfy farm, which has been recently refurbished, much of the original homestead survives. A large fireplace in the kitchen reminds visitors of many meals prepared. Original panes in the windows still exist - and one wonders how any survived the maelstrom of battle. Many of the solid wood floors are original - noted as the wider planks of the 19th century. Dozens of bullet holes remind visitors that the home was indeed in a perilous place during the summer of 1863. Robert Sherfy of Landsdowne, Virginia, the great-grandson of Joseph, shared a story about his father, Robert Ellwood Sherfy, who lived in the home as a very small child over a century ago. In one of the front bedchambers, young Robert E. was still in a crib that was placed against a wall, and one evening felt a hole behind the wallpaper. With his tiny fingers, he worked at the wallpaper until a portion tore away. He reached into the hole and pulled out a minie ball. And then he got into trouble for tearing the wallpaper. When asked the age of Joseph's little grandson, Robert replied, "Old enough to remember, and small enough not to know he shouldn't tear wallpaper." The Sherfy lineage goes far beyond Gettysburg to many states of the nation and many European countries as well. Sherfy/Sherfey relatives live in Kentucky, Tennessee, Indiana, Illinois, Kansas, Nebraska, Minnesota, South Dakota, Idaho, California, Washington, and Hawaii. Many have stayed close to Casper and Magdalena's original homestead (which still stands in Taneytown) and live in Maryland, Pennsylvania, and Virginia. More relatives have been found in Denmark and Germany. At the reunion, photographs were displayed of Scharffenstein Castle in Saxony, an ancient home of an ancient relative. Genealogists Marvin, Robert, and Steve have located a common ancestor in Adam Scherffigg, who was living in Saxony in 1401 - and they are still searching. Some of them still follow the traditional faith of Casper, who broke from his native Lutheran to become a Dunkard minister. Many Sherfys have pursued the ministry over the centuries. Other family members have pursued other paths, but they are honorable, kind, and generous, like their fathers before them. They are, in fact, the opposite of their family name, for " Scharff' means "sharp" or "rough". Centuries of passing through trials and adventures, including inquisitions, revolutions, and a civil war have polished them well. Before parting for their various destinations, the family posed for a photograph outside the Sherfy house in Gettysburg. Eighty-one years before, in 1925, members of the Sherfy family posed in the same place. Today's modern Sherfys gladly continue the tradition. As they said their goodbyes, the Sherfy/Sherfey/Scherfee kin spoke of a possible meeting place for their next reunion. Tennessee, the settling place of Johannas, was mentioned. A few places farther away, like California, were also proffered - in fairness to the many members of the family who live in the west. It might be another eighty years before there is another Sherfy reunion in Gettysburg. Wherever life takes them, one thing is certain - their roots are here - tied for all time to this nineteenth century town, and the fertile, beautiful farmland in the land of the free that drew Casper here in the first place. No doubt Casper and Magdalena would be delighted that their posterity have continued what they humbly began. 1. Grandma Haegen's quote is a family legend. However, historians have only been able to pinpoint that the Sherfys stayed at the Bucher Farm in Two Taverns, and not Taneytown. Whether they ended up in Taneytown with family is unknown, but Grandma Haegen did purportedly say when she picked up the spent bullet that Taneytown was at least an intended destination.